Michael and I standing on Dad’s Corvette! Dad (left) and his great friend, Rich Shook. Mom is the the one in the lawn chair! It’s interesting that some of the most extraordinary moments in your life occur at I time that no matter how hard you try you will not be able to recover them. 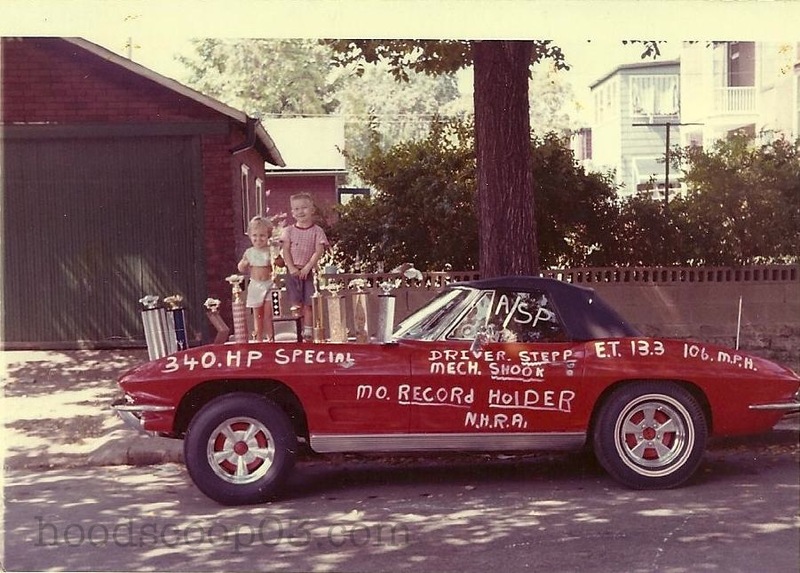 My dad, Rich Stepp, hard worker and family man, was a dragstrip driver whenever he could be. I wish I could recall standing on the hood of that red Corvette, but I can’t. However, I’ve known all my life that it was a ’63 with a removable hard top and that sometimes I waited for him at the finish line to ride back in it with his helmet on my head. I know that he changed out the rear end so my mom could get groceries in it. In addition, I do remember feeling cool…not that I was just at a race track, but I was part of the racing. 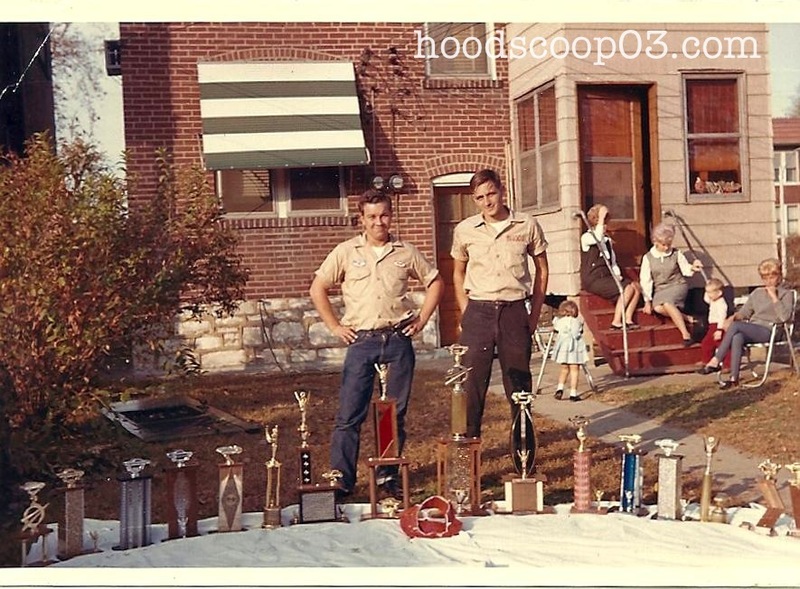 My dad won several trophies during those early years. He raced the Pevely, MO and Alton, IL Dragways to name a few. After his death, those trophies somehow fell through fingers, were misplaced by relatives that promised to keep them safe, etc. But my brother, Michael and I have never forgotten them. There was always a place for them in our home growing up…mostly on shelves made by Dad, near the shotguns! They seemed as tall as I was, and by the look of this picture they almost were. The common theme was ‘winner’, and our whole family was very proud of that. Michael and I have talked about those trophies from time to time and their importance to our family’s history. But like pages torn from a journal the trophies were no longer tangible. A few weeks ago, while at an antique store, I came across a handful of similar and well maintained trophies. The plates read “Alton Dragway” on all of them, but no actual person had been awarded the trophies. After buying one, I cleaned it up and had a new plate made for it. My brother who can be a man of many words when the hunting story calls for it or a man of few words when the moment just needs to be the moment displayed a solemn happiness when I gave it to him. It was one simple trophy replacing the others, but representing so much more. You might not be able to remember everything that happens to you in your life, but hopefully tiny snapshots of a few extraordinary moments will remain. So glad I was able to recreate a piece of our dad’s history. He was such a winner to us in his live-fast way. Crossing the finish line first may have happened over 40 years ago, but knowing that we lived in his winner’s circle is a trophy we are very proud of and it can never be replaced. Aside | This entry was posted in Journal, The Burnoff Area and tagged '63 Corvette, Alton Dragway, drag racing, Pevely Dragway, Trophey. Bookmark the permalink. Beautiful post… Could not agree more..
Here’s to the snapshots that make life worth living, make life extraordinary, and the friends and family that take them. Thank you so much for your thought filled comment. We are truly blessed. Great post and awesome old pics. I wish I could have stories like that but I can’t. All my family was into football (soccer) or horse racing, I was the only petrol head and always have been since I can remember. It’s so great that you are creating new stories now. Try to remember to keep your original words in a saved document. Sometimes we post quickly and I would hate that our words get lost. PS Petrol heads rock!! and cleaned up the grave.. He was ( like you said ) a good man, deserves to be remembered. Thanks for your blog.. I also took care of baby Miela. I’m so glad Family is as important to you as it is to me. You are the best mom in the whole universe. Thank you for taking care of Dad’s site. And thank you so much for being my biggest fan! Love you!